Practical Bible Teaching: WHO ARE GOD'S CHILDREN? In a slightly different fashion from the first two assessments, we are told about "doing what is right." Of course, 'doing what is right' also hinges on God's commands. Doing what is right is a measure by which we can know or recognize God's children. Therefore, I must ask the question—are those who do not do what is right also God's children? At first glance, that looks like a ridiculous question, doesn't it. The answer would seem obvious, and maybe it is. However, if we are moved away from this verse and talking about something else, we might hear something like, "We are all God's children." Without trying to be offensive to any who may have said or believe this, may I suggest to you that this is complete nonsense? The verse above and the verse we are considering from 1 John 2:29 both show plainly that not all human beings are God's children. This error has led to many false teachings that have filtered into the church from the poisoned waters of worldly wisdom. Therefore, let us understand the truth—only those who do what is right can be considered God's children. It is only God's children who come under chastisement, or discipline. (Heb. 12:8) All others are left to themselves to suffer the consequences of their sin. So, when we see someone who is not doing what is right, can we conclude that they are probably not a child of God? One of the seemingly most difficult concepts to grasp is that an event is not a pattern. Yet, how quickly we are to jump to judgement. Look for a pattern before trying to judge fruit. Just because the first apple you see on the tree is almost rotten does not prove that the tree only produces rotten fruit. The reverse of this must also be considered before we begin to claim many to be a child of God. Just because you see them doing something 'right' is not proof that he/she is a child of God. Just because the first apple you see on the tree is almost perfect does not prove that the tree only produces perfect fruit. However, the most important aspect of this assessment is personal—do YOU consistently do what is right? 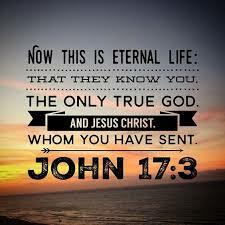 You are looking for proof of possessing eternal life so that you can quench the fiery darts (Eph. 6:16) of doubt the devil would hurl at you. What is your 'right-doing' based on? Is it based on what you feel at the time? Is it based on what others might think? Is it based on the fact that others are watching? Is it based on the way you were raised? Is it based on a particular ideology? Is it based on your current understanding of the Word of God? "Is your current understanding current? That is, is your understanding up to date?" Well, since the Word of God never changes, then my understanding is obviously up to date. I trust that your arrogance has not reached such a ridiculous height. Paul tells us in Romans 12:2 that we are to be transformed by renewing our minds. No doubt, our mind was renewed when we turned to the Lord (2 Cor. 5:17), but the transformational aspect is to be on a continual basis. It is not a one-off event. If your understanding is up to date due to your active and sincere pursuit of God through His Word, and you are purposely obeying what you learn, then you are probably doing what is right, which makes you a child of God.